I can’t stand Bo…he’s a creep, and I didn’t know that his brother is Bray…another creep. The sign is a perfect mashup for the slogan that both use…..great job, Bearman! I don’t know any of these guys. My husband watches now and then and just laughs. Why? Haven’t a clue. And I thought it was something to do with Bo Lupkin’s buzzard character. There’s this wrestler….a real creep, who like to tell the WWE universe that all they have to do is.”BOLEAVE!”. His name is Bo Dallas, and I’d like to just tell Bo to leave WWE. His brother Bray Wyatt is just as creepy. 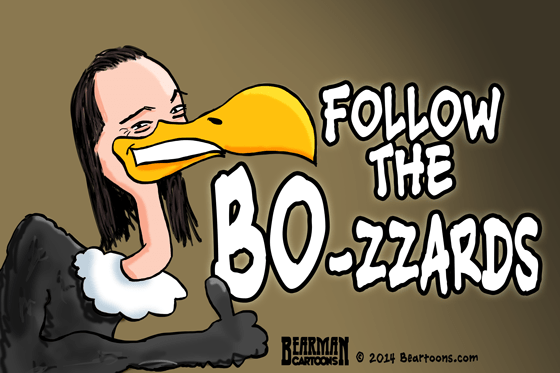 He always says, “follow the buzzards.” So this it where Bearman mashed them up together. I am very wrestling deficient. Thanks for the explanation. Good old Bo, the lumpkin one. Yes he must still be inspiring me in some way but it is more as Deb describes. Haw Haw! From here on out, every time I see that guy, I’m gonna think of this drawing! Wait are you admitting to watching? I wonder how this would read if Bozo the clown was included? Business in the front, party in the back. Good job! You really captured those pearly whites! Usually they say great minds think alike but then again it was you and Binky hahah JOKING!! I’m glad I’m the MM in that one! Maybe some of Ed has rubbed off on you, Tony.